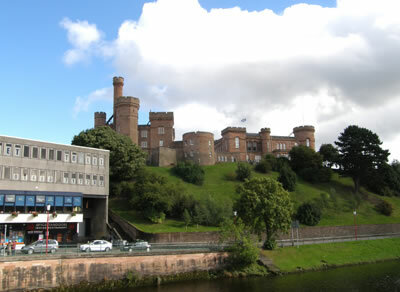 Inverness Castle was originally a 12th century earth and timber enclosure fortress, founded by King David I. In the early 14th century during the Wars of Independence, English troops under King Edward I occupied the castle, which was taken and destroyed by King Robert the Bruce in 1310. In the early 15th century Alexander, earl of Mar, founded a stone castle on the hill and in the 16th century George Gordon, earl of Huntly added a high square stone tower. Seizes and badly damaged by the Royalists in 1649, from 1653-8 Cromwell's Fort was built at the mouth of the River Ness. In 1726, General Wade transformed the castle into the square Hanoverian Fort George, with a governor's house and a chapel, encased by barracks. Surrendered to the Jacobite army of Prince Charles Edwards Stuart in 1746, the castle was blown up after the Battle of Culloden. A dramatic mid 19th century neo-Norman castle now stands on the site, built to house the Sheriff Courthouse and County Hall and all that remains of the medieval castle are a deep resorted well and part of the bastion wall. 7 miles south-west is Aldourie Castle and 12 miles west is Beaufort Castle.